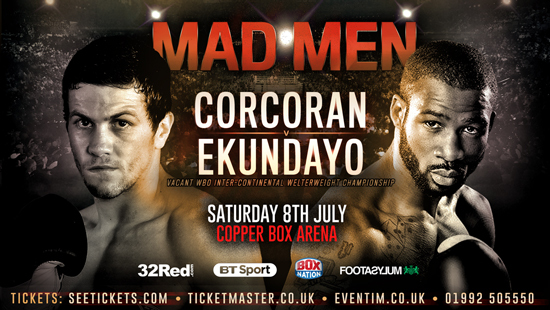 Wembley’s Gary Corcroan will face Stoke Newington’s undefeated Larry Ekundayo for the Vacant WBO Inter-Continental Welterweight strap at London’s Copper Box Arena on Saturday 8th July. Corcoran, 16-1 7 KOs, recently moved down to Welterweight after losing out in an eleven round thriller for Liam Williams’ Super-Welterweight Lonsdale belt in July 2016. Known as the ‘Hellraiser’ for his ferocious all-action style, 26 year-old Corcoran is now planning an assault on the domestic 147lbs division. Nigeria-born Ekundayo, 34, is a former Prizefighter Champion and is undefeated in 12 outings since joining the professional ranks in 2012. ‘The Natural’ is eager to prove himself again on the big stage and is looking to make a statement against Corcoran. “This is a fight I have wanted for a long time,” said Corcoran. “Larry will be the fourth undefeated fighter I have faced in my last six fights. Nobody wants to fight him, he is a very good fighter, slippery and awkward. I have done a lot of sparring with Larry and it’s a good matchup, I’d like to thank Frank for the opportunity. “Everyone in boxing rates Gary as a top fighter,” said Ekundayo. “He is a tough tough man and will be in my face all night. This is a big test for me but I will be prepared for whatever he brings on the night. If I beat Gary I will get the respect I deserve in the boxing circuit.